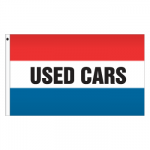 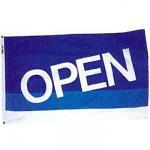 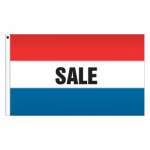 3' x 5' Fancy Message Flag - "Open"
Our message flags are 3' x 5' and made of quality outdoor nylon. 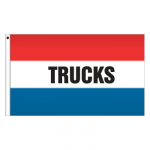 The flags are red, white and blue and have black lettering. You have two choices for the finish of your flags, (Canvas Header & Grommets), or (Pole Sleeve Shut at Top to fit poles up to 2”). 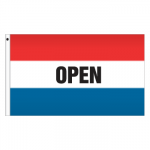 Reads correct on one side and mirror image on the other side of the flag. 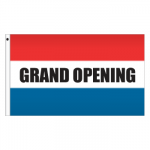 3' x 5' Message Flag - "Antiques"
3' x 5' Message Flag - "Car Wash"
3' x 5' Message Flag - "Grand Opening"
3' x 5' Message Flag - "Models"
3' x 5' Message Flag - "New Homes"
3' x 5' Message Flag - "Now Leasing"
3' x 5' Message Flag - "Open House"
3' x 5' Message Flag - "Open"
3' x 5' Message Flag - "Sale"
3' x 5' Message Flag - "Trucks"
3' x 5' Message Flag - "Used Cars"
3' x 5' Message Flag - "Welcome"